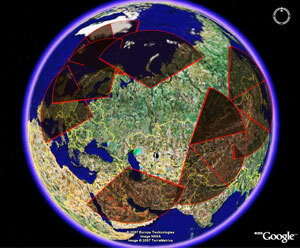 A few recent developments changed the map of coverage provided by the Russian early-warning radars. First, Russia began operations of a new Voronezh-DM radar in Lekhtusi. The radar has been operational for a while, but only recently Sean O'Connor, who maintains a very interesting site IMINT & Analysis, located it on the map. Thank you, Sean! The radar is at 60 16'31.47"N 30 32'41.96"E. A similar radar is under construction somewhere near Armavir, but that hasn't been identified yet. The radar is Armavir is supposed to close the gap that has been created by the decision to stop using the radars in Ukraine - in Sevastopol and Mukachevo. I should note that the size of the radar fans on the map do not necessarily reflect radar detection ranges - these are normally larger than shown here. Also, there is no information on the angle of the Lekhtusi radar fan - I assumed that it is close to that of Daryal radars. Pavel, I am curious about this decision to stop using radars in Ukraine..Is it permanent and more important, is it immediate? Are the Ukrainian radars already outside of the EW network? As far as the open literature claim, the will be abandoned AFTER the start of operations of the Armavir site. That’s December 2007 or early 2008. I really doubt the Sevastopol and Mukachevo sites are already discarded. The military have been complaining about reliablity of Ukranian radars for a while, so my guess is that for practical purposes the radars are no longer in the network. Interesting. Those radar fans suggest no coverage of Israel. That seems improbable. That's because the Sevastopol HEN HOUSE BMEW radar facility would have covered that gap, and it is now no longer used as Pavel noted above. The new Voronezh-DM in Armavir will close that gap when it is completed. Besides, I doubt Israel has plans on firing Jericho MRBMs into Russia anyway. So Armavir will replace Sevastopol and Mukachevo rather than Gabala. Rigth? Do someone know the “looking” vector (SE or SW? ), the reach and width-angle of the fan for the Voronezh-DM?